Last week I spent a few days in Seattle (family and work). While I was there, I had the pleasure of going on the Theo Chocolate factory tour, something I didn’t know existed until quite recently. I wanted to talk about it briefly today, as I learned a few things that I’d like to apply to marketing and crowdfunding. The 1-hour tour was broken into two parts, both led by a friendly tour guide. The first part was spent learning about where Theo’s cocoa beans come from. We learned about why Theo works with specific farms and the care they take to prepare the cocoa. Crucially, during this part of the tour, we were given chocolate samples (starting with 85% dark and working down towards 45%) to munch on while we were listening and asking questions. I think this was really clever as opposed to waiting until the end of the tour for samples–I was much more present as a result. 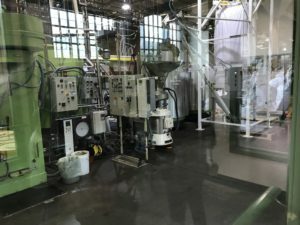 We then transitioned to a glassed-in room right in the middle of the factory where we learned step-by-step how the cocoa is processed and turned into chocolate, one machine at a time. And not just machines–we saw a number of people moving around the factory. The tour guide reinforced the care and attention that goes into making the chocolate at Theo. At the end of the tour, we were surprised to learn that each of us would receive a 20% discount that day at the Theo gift shop. The shop was right there–we didn’t need to go online, and we could start eating the chocolate immediately if we wanted. I found myself walking through the store, picking up random things to buy (and I wasn’t alone in doing this). What does this mean for other companies and entrepreneurs? The story matters. By the end of the chocolate tour, I felt like I had a personal connection to Theo Chocolate, a company I had never even heard of until a week or so ago. I think every company and entrepreneur has an opportunity to create that connection by telling their story, whether it’s on their website, in person, or via formal tours. It’s a great reminder to me that I should make it easy for newcomers to learn the Stonemaier story. This is kind of shown on the About page of our website, but it doesn’t really inspire the personal connection I’d like to strive for. the one-time special discount: I wasn’t bargain hunting for chocolate. Rather, receiving the 20% discount made me feel special, and it gave me a nudge of urgency to act now. Kickstarter creators can do the same thing by offering a discount on reward levels as compared to future retail pricing. the ability to taste the chocolate during the tour: Each backer wants a different type of “taste test.” Some want to test the game on Tabletopia or Tabletop Simulator. Others want to read the rules or make a print-and-play copy. Or maybe they’re like me and they want to watch/read a few reviews. For me, the Theo Chocolate tour was a great reminder of the impact of sharing behind-the-scenes information about the design, development, and production processes. Sure, this information typically only reaches people who have already opted in to consume it, but I think the transparency reinforces their loyalty and trust, especially if I’m open about both good and bad news. Has a tour ever had this kind of an impact on you? This series features innovative strategies from non-Kickstarter, non-tabletop game businesses as they might apply to creators and entrepreneurs. I think your live streams do this for me. I got hooked by your games, but now I feel a personal connection. Some of that might also come from being on the ambassador team. We haven’t actually met yet, but from your posts, videos, and brief email exchanges, I kind of feel like we have. Thanks Joshua! I appreciate that about the live streams–that’s me, raw and unedited, so I can see how that can help create those connections. It helps that you, raw and unedited, is a positive, thoughtful, and caring image that’s good for business as well. Some people probably need a more edited version of themselves as company representatives, or at least a filter to be sure not to be taken the wrong way. I guess that what bounds people together are feelings more than thoughts, rational or reasoning. It seems that your experience was filled with sympathy, a lot of sensorial feelings (tasty, visual, touch…) and surprise (had you know about the 20% discount before and you might not have been so impulsive to take it). I recall a tour I did with my family (and some strangers) to Hellbrunn Palace in Salzburg. The whole group was in such a good mood and the guide was so genuinely humorous that I remember nothing of what I saw and no names at all, but I do remember how I felt. And these feelings I remember is what bounds me to that place/experience. Nuno: I like how you focused on the feelings here, and I think you’re absolutely right. I’ll soon forget the details of the chocolate-making process, and I’ll eat all of the chocolate, but I’ll still associate great feelings with the experience. Jamie: I really appreciate you sharing your experience as I agree when there is a personal connection to the product or “Purpose” it becomes even greater. I may have mentioned this before, but what I’ve learned from Simon Sinek’s TED Talk (Start with WHY) is “People don’t buy WHAT you do, People buy “WHY” you do it. I would love to show you my WHY if you are ever in Las Vegas, I would love to give you a tour of a national treasure that I am so proud to be a part of. I’ll send you a message on Twitter and Instagram.